THE MYTH: Athletic kids get injured in the same way athletic adults do. THE REALITY: Kids don’t sprain/strain nearly as much as they break. At one point, our sports therapy clinic had twelve kids with broken backs coming in for rehab between the ages of 10 and 15. TWELVE! Which sports? Soccer, football, and gymnastics. Why? Because nobody was paying attention to their mechanics and their complaints of back pain were being chalked up to strained muscles, sprained ligaments and “tightness”. Hot on the heels of XC season, track season is now in full swing. RunLab is always inundated with injured kids this time of year. How can we slow down this trend? Read on. When it comes to young athletes, I have noticed a disturbing trend in the last decade that shows no sign of slowing. Kids no longer rotate haphazardly through several sports during the school year, with the occasional ridiculous intramural thrown in for fun. Our choices were things like badminton, floor hockey, and pickleball…basically the stuff that incites the quizzical “what is that sport again” look when you say you have to go to practice. Nowadays, it is the norm to find even the most mediocre young soccer player, gymnast, or runner training year-round in a single sport, much the way a college athlete might train. Often this means they are not only participating on a school team, but on a club team as well. Their parents are spending weekend after weekend driving them to tournaments and meets, not to mention the morning and event practices during the week. The problem with this trend is that kids are getting injured like crazy. We work with a ton of kids at RunLab, from brand new athletes to JR Olympic medalists, many of whom either currently have or have had injuries significant enough to require surgery. Most of our competitive middle and high school runners are running somewhere between 40 and 60 miles per week, which is A LOT for a young kid who still has open growth plates. Much of the time this high weekly mileage is a result of two major problems. One, a major disconnect between two separate coaches (school and club) who aren’t kept abreast of what’s going on with the athlete outside of their team’s training program. And two, extremely motivated young athletes that think more training is better and are adding on their own mileage outside of their supervised training. 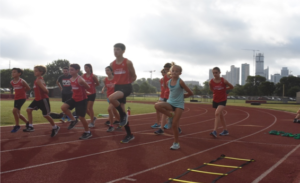 We helped an 11 year old runner with hip pain who was being forced to run in gym or risk receiving a failing grade, despite the fact that she was preparing for Indoor Nationals and was logging 30-40 miles per week outside of school. I have countless similar stories involving young football and volleyball players being required to play despite possible low back fractures (this is a common injury in any sport requiring a lot of extension through the lumbar spine), swimmers being forced to survive “Hell Week” (a brutal several hour per day rite of passage for young swimmers) despite rotator cuff tears, and gymnasts being convinced to continue practicing with sprained ankles and low back pain. The number of ACL tears and broken lumbar spines in young soccer players, volleyball players and gymnasts, along with preventable overuse injuries like stress fractures in cross country and track runners before they even make it out of high school is staggering. At RunLab we make it a point to be in close contact with coaches of young patients that we treat, in an attempt to make sure we are all on the same page in keeping kids injury-free, but it is also vital that parents take an active and informed role in a child’s training schedule. Dreams of playing or running for a D1 school are quite easily shattered with a blown ACL or broken lumbar vertebrae. So what can you do as a parent to help prevent injury in your young athlete? 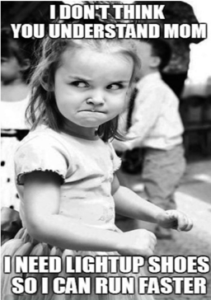 • Closely monitor your child’s mood. This is tough with teenagers but you know, better than anyone, what is normal for your child. If they are constantly fatigued, getting sick more frequently than usual, or especially irritable or moody, look at what’s going on with their training, it may be time for a day or two off (and I mean REALLY off…like sit and watch movies and eat popcorn kinda off…not two days spent in the gym instead of on the field or track). • Nutrition is HUGELY important in young athletes. They are growing like any other kid, but they are asking a lot more of their muscles and joints than a sedentary child. It is difficult to force healthy eating habits at school, but teaching your child the link between increased performance and nutrient dense food might be all it takes to get them to buy in. It is especially important to closely watch young female athletes, who are at major risk for developing body image issues and Body Dysmorphic Disorder. 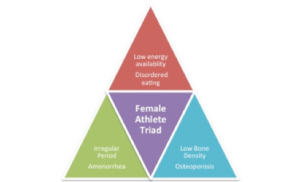 Be familiar with the female triad (stopping of menstrual cycle, disordered eating, and decreased bone mineral density) and how to prevent it. This is a BIG deal in young athletic girls and is much more common than you might think. As they go through puberty and begin to put on adult weight, their running often slows down temporarily, leading talented runners to worry about their running, thinking they need to train harder, run more, or eat less. • Choose your club coach wisely. Make sure that the coach understands not only your child’s true talent level for the sport, but also his/her short and long term motivation. If your child is on the team for camaraderie and fun over commitment to winning and a college scholarship, forcing your (no matter how talented) kid onto the wrong team can have serious mental and physical repercussions. • Kids are rarely in need of more stretching. Unfortunately, it is a standard practice in the athletic world (and all too often in the medical field) to tell people they need to stretch more no matter what their actual range-of-motion looks like or what type of injury they have. I had a 12 year old runner with a hamstring injury whose doctor was insistent that she stretch her hamstrings daily. Not only could she touch her knee to her forehead, her hamstring was strained and thus, overstretched already. • Proper shoe choice is important, don’t skimp on this, especially if your child’s sport involves a lot of running. The wrong shoe can lead to injury, unnecessary soreness and muscle fatigue, and decreased performance. • Make sure that each coach knows what the other is having your child do. Having everyone on the same page will help prevent overtraining, which leads to injury. When forced to choose one workout over another, choose quality over quantity. • Muscles need hormones like testosterone to grow in size, meaning that to build muscle mass, kids must have gone through puberty. his means doing any type of weight or resistance training with anything other than body weight is putting your child at risk for injury without any added benefit. Keep the “strength sessions” to play-based stability and skills training. The payoff is huge and the potential for injury is much smaller. To sum it all up, never underestimate the importance of skills training, even in sports like cross country. Hip stability, proper and balanced flexibility and strength and a strong core are vital to injury prevention in any sport. Unfortunately, most kids are not going to go on to play college sports at a high level, and even fewer of them will move on to the pro ranks. Is it really worth risking injury to a body they are going to have to live in for the rest of their lives? They may think so, but that is where we as parents, coaches, and doctors need to step in and help guide them. Remember tetherball four-square, and roller-skating? Despite the very adult way many of these athletes approach their training, they are still kids, and they will be much healthier adults if equal attention is not only given to regimented training, but also to what kids do best (or used to)…play. Now…find your kid and go build a fort. Kids don’t sprain, they break. Take lingering pain seriously. Most kids don’t usually need more stretching to fix an injury, they are already bendy (sometimes too bendy). Make sure that you are seeing a doctor who is used to working with young athletes. Certain sports predispose kids to spondylolysis and/or spondylolisthesis (broken and sometimes dislocated vertebrae in the low back). Watch for ongoing low back pain in football players (especially QBs), tennis players, soccer players, gymnasts, dancers and track & field athletes. Kids who don’t “specialize” in one sport early on will experience less load in the same area over and over and over again, which is a healthy thing for growing bodies. Watch the running volume in kids participating in club and sport, the cumulative volume sometimes spikes drastically as they enter high school and can break even the most gifted runners. Girls will often slow down temporarily as they hit puberty and put on weight. This is normal and their speed will come back, but watch their eating and training habits closely as many will worry about their speed and start overtraining or undereating. Growth plates aren’t closed until the late teens, be careful with volume. Prepubescent kids can’t build muscle-mass, so added weights risk injury without benefit. Focus on skills based training and body weight exercises. Kids look funny when they run?